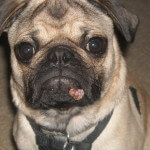 What’s that weird, pink, warty-looking growth on Fido’s lip? Don’t worry, Fido isn’t disfigured for life. We commonly see young dogs (typically under 2 years of age) whose owners have noticed a warty growth on the lips, nose or muzzle. 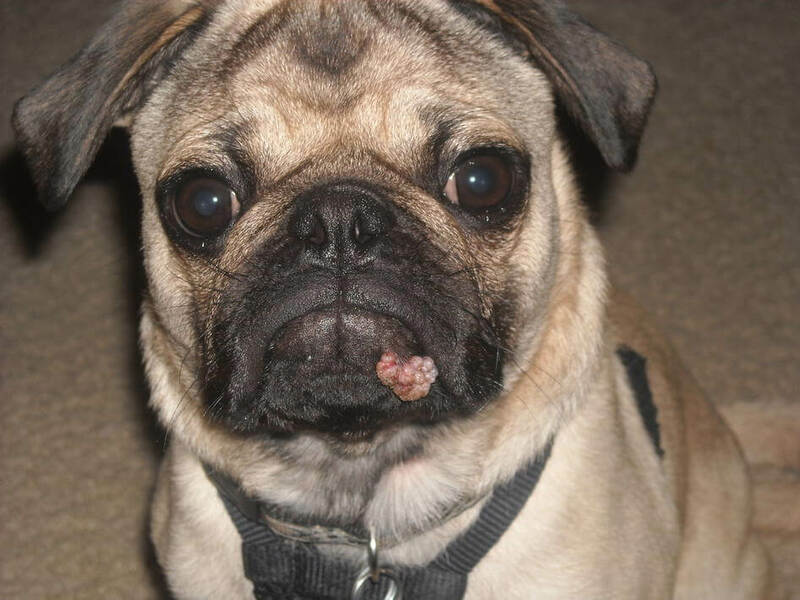 These warts don’t bother Fido, they don’t seem to grow or change rapidly and they are almost always confined to the face, especially the lips or mouth. 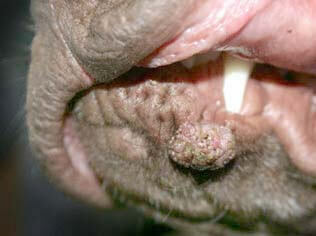 In a lot of cases, warty growths on the mouth/face of young dogs are benign viral papillomas. Essentially, these are warts caused by a canine virus that Fido picked up at the park, or even walking down the street in your neighborhood. Most dogs are exposed to this virus at a young age; some pups develop warts upon infection with the virus, while others never show a single symptom. Older dogs don’t develop viral papillomas since the virus only tends to affect juveniles, who still have a developing immune system. Not only are these warts benign (good news!) they are also self-limiting (great news! ), which means that they require no treatment. Viral papillomas will dry up and fall off on their own, usually after several weeks to a month or two. These warts are not known to cause pain, discomfort or itching at all. Finally, and importantly, these are not contagious to humans, or other animals, but can be considered contagious to other dogs. There are certainly plenty of other skin growths that Fido can develop (most of which are benign, but some of which may be malignant) so it’s important to have any new lumps, bumps or warts checked by your veterinarian. There isn’t a specific test to confirm whether a growth is a viral papilloma, other than surgical excision and biopsy. However, we see enough of these to feel confident in the diagnosis without resorting to biopsies. Only if the wart persists beyond several weeks, if it rapidly grows or becomes ulcerated, or if it causes Fido discomfort, do we recommend removal and biopsy. Viral papillomas are so common, in fact, that I saw two separate patients today with them! (One had a growth below his nostril, and the other had a papilloma on her tongue!) Viral papillomas are common, and they go away with no treatment whatsoever. I say to clients all the time: “I like problems that solve themselves.” And viral papillomas do!